A 14k solid gold enameled autism awareness hand pendant necklace with red heart in the center. 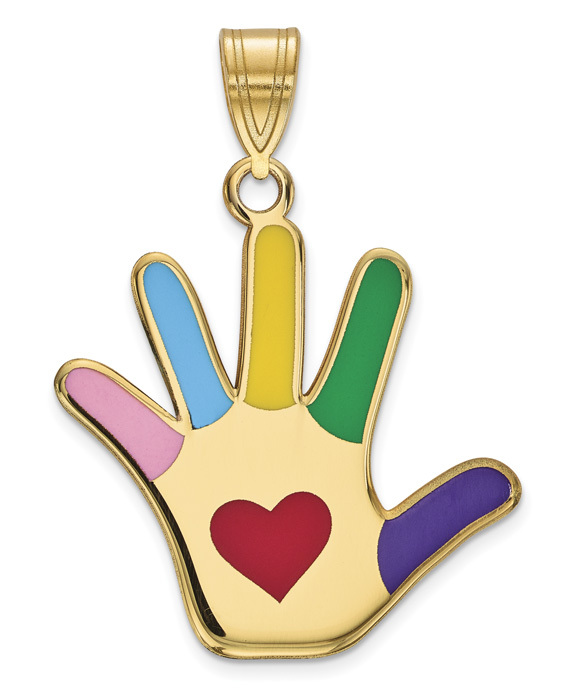 The autism awareness hand pendant measures approx. 13/16" tall or just under 1 3/16" tall with the hoop and bale. The bale's opening measures 7mm x 3.6mm to accomodate your chain necklace. You can also add one of our 14k solid gold 0.9mm box chain necklaces in 18" or 20". Also available in various styles, shown below - helping raising awareness for Autism in the U.S. and globally. We guarantee our 14K Gold Enameled Autism Awareness Pendant with Heart to be high quality, authentic jewelry, as described above.